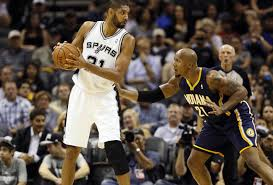 In some respects, it should not come as a surprise that the Indiana Pacers and the San Antonio Spurs are the two #1 seeds as the NBA 2014 playoff season begins this weekend. First, of the 16 playoff teams, the Pacers had the most victories at home with 35. The Spurs, on the other hand, had the most road wins of the playoff teams with 30. Here’s a look at the number of home and road wins for each of the 16 teams in this year’s NBA playoffs (each team played 41 home and away games in the season). Of the 16 playoff teams, the Pacers had the biggest disparity between home wins and road wins during the 2013-14 regular season. The Pacers had 35 home wins and 21 road wins, a disparity of 14 wins. Brooklyn and Houston were next, each with a +12 disparity between home and road wins.